“A lot could change in the next few months but it looks as if the producers’ hopes for a happy New Year with de-stocking continuing into 2018 at the same 500 kb/d pace we have seen in 2017 may not be fulfilled,” the agency wrote. In the past few months, a sense of bullishness and optimism returned to the oil market for the first time in years, but the IEA warned that it won’t last. The news wasn’t all bad for oil bulls. OPEC production fell by 130,000 bpd in November, due to lower output in Saudi Arabia, a rather large decline in Angola, and the continued erosion of output from Venezuela. It is the fourth consecutive month of falling output from OPEC, and the compliance rate for the cartel jumped to 115 percent in November, the highest rate so far this year. That bodes well for the extension of the deal – OPEC and its partners seem resolved to keep compliance high heading into 2018. Inventories also continue to decline. The IEA said that OECD commercial stocks fell by 40.3 million barrels in October to 2,940 mb, the lowest level since July 2015. That decline was almost twice as large as usual for this time of year. And for crude inventories specifically, they fell counter-seasonally by 19.7 mb, including the first decline in China this year. But even there, the IEA was quick to point out reasons to be bearish, noting that the inventory drawdowns will soon end. 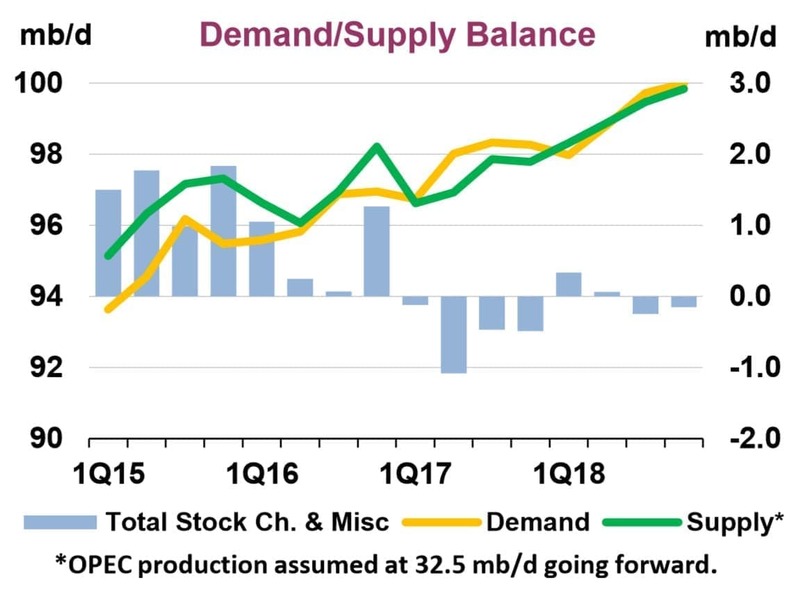 “Going into 1Q18, our balances imply that global oil stocks will increase by 300 kb/d, assuming stable OPEC crude production of 32.5 mb/d,” the IEA said in its report. Those increases in inventories in 2018 largely come down to U.S. shale, which continues to grow at an impressive rate. Rystad Energy says that almost 1,000 horizontal wells were completed in October, the highest total since March 2015. That should ensure a rush of fresh supply will be added onto the market by the end of this year and into 2018. Overall, the downbeat conclusions from the IEA report were largely backed up by OPEC itself a day earlier. The cartel published data that also anticipated large increases in U.S. shale output, including an upward revision for 2017 output by 150,000 bpd – an acknowledgement that shale drillers are adding supply at a faster rate than expected. More ominously, OPEC predicts that the U.S. will add more than 1 mb/d of new supply in 2018 – a truly staggering figure. Putting it all together, OPEC is essentially keeping 1.2 mb/d off of the market in 2018 so that the U.S. can add 1 mb/d. It’s a quite a gamble; a bet that by doing so, the group can prevent oil prices from falling. But the payoff is debatable. OPEC is selling less oil and allowing the U.S. to sell more. The bet is that next year inventories will fall and oil prices will gradually rise, but the IEA’s report predicts that such a scenario may not play out. Thats at least 5m barrels a day of new production needed just to stand still. Can you explain? Two more important questions might be: "What is the IEA's track record on making accurate forecasts?" and "Why are they pouring cold water on the oil market? Having read your most recent article titled:”Is the Oil Glut Set to Return?”, I advise you to scrutinize very carefully any figures you quote on US shale oil production, US oil stocks, global proven oil reserves and the global demand for oil from the US Energy Information Administration (EIA), the International Energy Agency (IEA), BP through its Statistical Review of World Energy and the Financial Times (FT). Despite very positive signs in the global oil market and despite OPEC/non-OPEC production cuts, oil prices have been struggling to break through the $60/barrel barrier since January 2017 until recently. Circumstantial evidence suggests some sort of concerted efforts by the IEA, BP, the EIA and the FT to prevent the oil price breaking through the $60/barrel barrier. The rationale is that a price under $60/barrel is good enough for US shale oil production to breakeven and not high enough to slow global economic growth. The above mentioned bodies are four of a kind. They represent the major consumers of oil (particularly western consumers) and, therefore, have a tendency to exaggerate global oil reserves, production and discoveries, US shale oil production increases and reduce global demand for oil in a blatant attempt to intimidate the oil price. Examples are abound. The minute the oil price looks as if it is going to break through the $60/barrel barrier, one or all of them in synchrony give what appears to be innocuous projections on reserve additions or the longevity of the glut or additions to the US oil stocks thus dampening the rise of the oil price. As expected, these statements or projections are eagerly reported by their mouthpiece, the Financial Times. With the oil price above $63/barrel, the IEA suddenly decides to revise up the expected growth of US shale oil production, which goes a long way to torpedoing the excitement around the OPEC extension. Also it declares that it sees oil demand growing by just 1.3 mbd. In other words, the glut will continue through 2018. And as if this is not enough, BP comes forward with a timely statement about a significant increase in global proven oil reserves. BP has a history of making such claims. In its 2017 issue of Statistical Review of World Energy, BP claimed that the United States has overtaken both Saudi Arabia and Russia in 2016 to emerge as the world’s top crude oil producer when, in fact, US oil production was estimated at 9.3 mbd compared with 11.23 mbd for Russia and 10.19 mbd for Saudi Arabia. Any sign of the oil price heading upwards prompts the EIA to claim a huge addition of a few million barrels to US oil stocks or increases in US shale oil production. An addition to stocks could only happen in one of three ways. One if the United States is producing far beyond its oil needs. This is not the case otherwise it will not be importing between 7-8 mbd. The second way is that the US is importing so much thus increasing its stocks. If this is the case, then the demand for imports should push the price up. The third way is if US domestic demand for crude oil and gasoline is declining. This is not true either. The US domestic demand for gasoline in the period ending July this year at 9.87 mbd, broke all previous records. As to depletion rates, they are deceiving. In many wells, perhaps a third of oil in place is recovered over the first years of production. But enhanced recovery techniques allow continued production and even a return to a "depleted" well for another round of production. Peak oil devotees who rest their assurances of global collapse on "depletion" data have overlooked a legion of contrary data -- including the fact that the same song has been sung for almost 100 years now, unrequited to this point. And likely into the foreseeable future.